HVAC system's capacity is a function of outdoor air temperatures (OAT). Some estimates suggest an HVAC system's total capacity decreases by as much as 3% for every 4°F (~2°C) increase in outdoor air temperature. With focus on HVAC efficiencies on the rise and ever increasing electricity costs, it is important to monitor outdoor air temperature precisely. 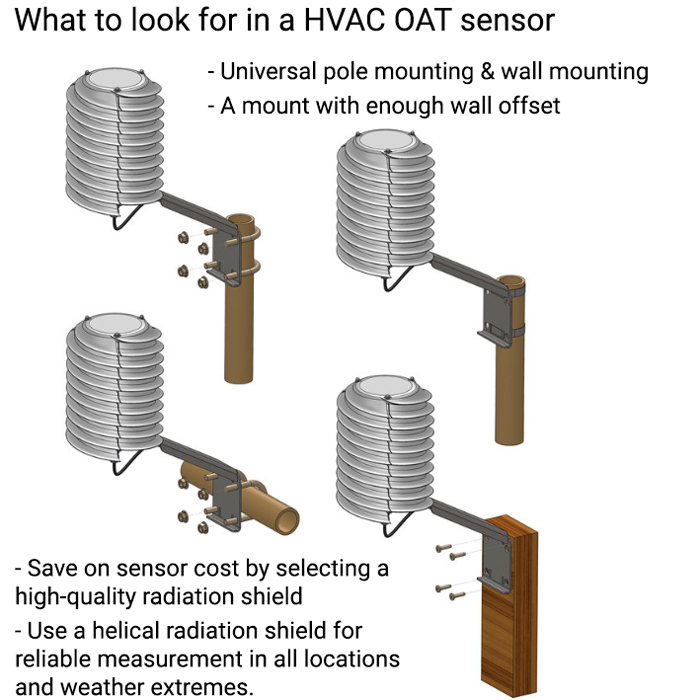 In the past, accurate OAT measurement has been cost prohibitive, but one small manufacturer with roots in upstate New York has come to the rescue with a patented design of a helical solar radiation shield for air temperature and humidity sensors. Helical solar radiation shield for hvac outdoor air temperature (oat) sensors by barani design. A little-known company in the HVAC world, BARANI DESIGN Technologies, boasts years of experience in the meteorological sector. See "Helical radiation shield technology set to revolutionize air temperature measurement". Barani Design's experience in the aerospace industry nurtured at Rensellear Polytechnic Institute and Boeing, has led to many innovative designs. The helical radiation shield, while seemingly simple, is proving to be the biggest innovation in air temperature measurement in decades. The helical solar radiation shield achieves a combination of high accuracy and superb sensor protection unmatched in the market. It is able to measure air temperature accurately even in the proximity of sun-exposed exterior walls and other radiative heat sources which include HVAC rooftop systems. The device creates an internal vortex, which feeds fresh air to the OAT temperature sensor while providing 360° shielding from radiated heat and sun. Improvements in accuracy can reach up to 8 °F on sunny days. Save time and money by installing your temperature sensor as close as possible, even if that means installing it on a sun-exposed wall.